Let’s start – what do we need ? 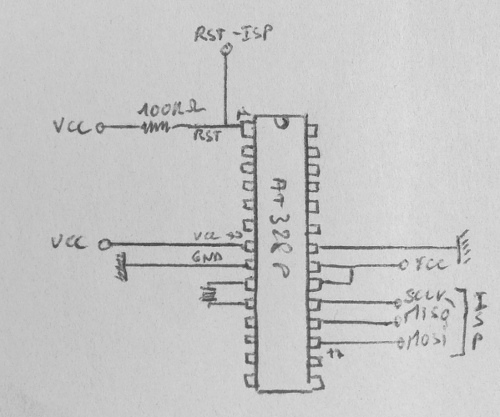 We need to have a AtMega328P plus a couple of wires to get the following circuit. This schema use a 16Mhz Quartz but it will be removed once the system setup. Then, we need to use an ISP programming board like this one (USBASP v2). Another solution is to use another arduino as an ISP (see this article). The first step is to use avrdude to program the bootloader. We are going to choose ATmegaBOOT_168_pro_8MHz.hex which is a bootloader using the internal oscillator instead of the external one. Arduino will now work at 8Mhz and do not need external Quartz. To change the oscillator mode, we must also update arduino fuses.They are some kind of hardware configuration registers. There are 3 of them : low fuse, high fuse and extended fuse. What we are going to change is the low fuse to change the clock source to be internal (8Mhz internal Osc). For this the last 4 bits must be 0010. We will also change the startup timing to “slowly rising power” to delay startup after reset to 65ms. Now, the 16Mhz Quartz can be removed. Now, i will connect a LED to the pin #15 corresponding to GPIO 9 usable as a PWM to test it with the Fade example. So in the arduino environment, open and compile Fade example (in basic folder). To be adapted to the device we are building, choose Arduino pro or mini as card and AtMega328, 3v3 8Mhz as processor. Now the led should start blinking ! At this point the power consumption of the circuit is about 6mA at 3.3V. It is interesting to notice that if you have a 5V supply you will be at 20mA for the same thing. Don’t forget to switch back to 5V to program the device, otherwise you’ll get programming error. What is important is being able to come back from this sleep mode to execute some peace of code. This table is indicating the different events waking up the arduino. The best mode for power saving is SLEEP_MODE_PWR_DOWN according to these measures. This mode can be resumed from watchdog timer. sleep_cpu ();   // power down ! You must take into consideration that wakeup time is about 65ms. With a such consumption, the battery life estimation for a standard AAA battery is about 6 month. The current consumption in a such mode is about 26uA at 5V and 21uA at 3.3V. The battery life can be expected around 3 years which is good enough for my project. 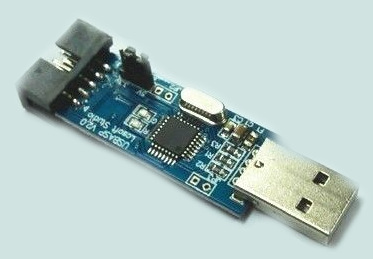 This entry was posted in Hardware and tagged arduino, atmega, embedded, energy. Bookmark the permalink. Have you allowed a project to run since you wrote this? Does it appear to be still running? I’m curious to see if the theoretical life can actually be observed. Can you post the full code please ?